Jeju Island(제주도), the most favorite attractions wish to go for Korean as well as foreign traveler inside Korea. According to statistics, there were over 15 million of peoples visited here during last year. In recent years, 'To live in Jeju Island for a month' has become a wannabe life style to Korean. People love its’ unique stunning nature and quite different culture compared with the main land. Thanks to mild and warm temperature all the year and masterpiece resulted in specific volcanic activity, this island has boasted diverse flora, dark gray volcanic rocks and ash soil, clean and awesome emerald color beaches. This is treasure box of geo-nature. It is said that it was made by several times of volcanic eruption ever since made 700 to 1200 thousand years before. 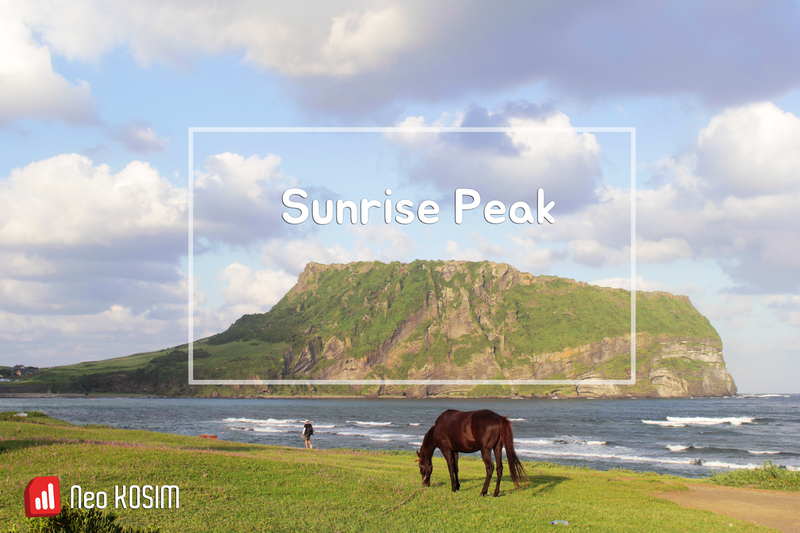 I dare say that the best attractions spot among spectacular beautiful views in this awesome island must be the very right Seongsan Sunrise Peak(성산일출봉,Seongsan ilchulbong). This is situated in the eastern seaboard of Jeju Island. For this reason, spectacular sunrise always was given to the early morning hikers. On each New Year’s here is crowded with lots of people who meet the first sun of the year and make a wish while see the wonderful sunrise. When I arrived at the morning around 9AM, there were already many peoples in ready to hike this peak. In particular, in spring and fall season, here is always crowded with groups of middle and high school students because they consider this destination as the essential course of a trip for educational aspect together with the Mount Halla. The group youths visited for the experiential learning were busy bustling to take a group picture with peak as the backdrop. There was pleasant and vibrant noise. Temperature of this island is much higher than as main Korea. When I visited there in the beginning of September, the temperature was rather close to the end of summer due to the strong sunlight. I headed for the peak step by step as if I was forced by the power of magnet. The youth passing me ran just like rocket with loud laughs. They said it takes 50 minutes to one hour enough to climb up and down this small peak. But not me. But not me. My poor body strength. So, I had to stop several times to get my breath back again. To be fortunately, there were proper brief rest zone in the many points. Thanks to break, I'm sure that I could put the beautiful sceneries filled with fine beaches, waves and winds surrounding this peak, unique rocks and diverse flora into my eyes and mind much more than those who went to the peak. The joy of life comes from unexpected moment sometimes. When I reached the peak, many people were making their memories in their own way. To be frank with you, I was a little disappointed when I saw the peak. It looked like a small football ground slightly hollowed land as if the spaceship touched down there. It was unusual for the top edge to be as sharp as the end of the crown. I came up with my mind for a while that I wanted to run down to that wide ground. This peak was an island at first. As times go by the sands and gravels were flown from the neighboring seashore into this islet and it had resulted in the connection to the main land of Jeju Island exquisitely. As I descended from the summit, it seemed that the narrow and slender beach on the far left of this peak is evident of its' formation. The descending wooden stairs made a harmony with the greens and I had to wait because the pure and marvelous nature were providing the fantastic shooting points to visitors. FACTS: This is the typical soft tuff cone in the world and provides important formula text about the eruptive and depositional process of hydro-magmatic volcanoes. It said, this was made by the hydro-magmatic eruption of volcano under shallow sea bed, just under the sea about 120 meters in depth, five thousand years before presumably. This peak has vertical cliffs showing diverse inner structures in three sides except west side of it formed by erosive action of the strong winds and waves since ever made. In 2007, Jeju Volcanic Island and Lava Tubes became the first site selected for its natural significance by UNESCO. It ranked top 7 in the world superb natural landscape in 2011. TIPS: The best time to visit Jeju Is. is in the spring or in the fall. Jeju Island has lots of tourist attractions to see and feel. Segmenting it into east, west, south, middle and neighbouring islands is also one of the ways to save your time.